Let me preface this by saying that this is my new favorite outfit in my closet. And I don't mean in any way to sound like my head is up in the clouds or I'm tooting my own horn. But there has to be just one outfit in every girl's wardrobe that makes her feel instantly pretty and confident, that special outfit that epitomizes her personal style. This is that outfit for me. This evening, the fiance and I did some very last minute Christmas shopping and treated ourselves to dinner before making our way through the chaos of harried shoppers. We never go out on a weeknight, and it was fun to break up the monotony of the work week. 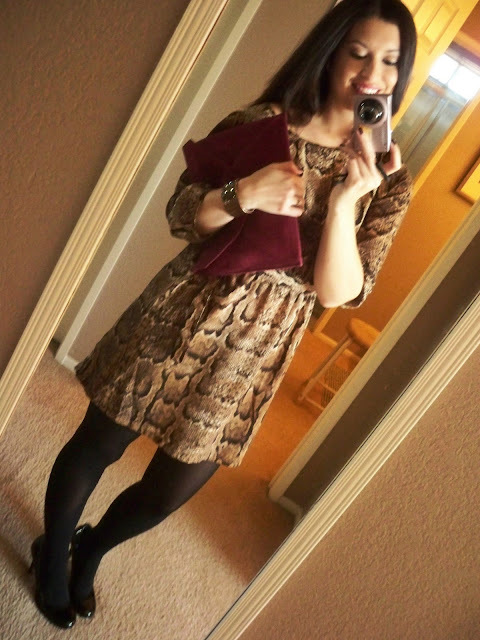 Equally fun was my snake print dress, paired with my suede ASOS clutch and a rose gold/marcasite bracelet from TJ-Maxx. I love this dress on you!! I just found your blog through Honeybee and I am so glad that I did! Our styles match and it's nice to see some styles that I like but haven't tried yet on you because we look like we have the same body type. I love this outfit, no wonder it's your favourite! Love this!!! you are on a roll!! Im loving everything you wear lately. cute! it's great to have an "it" outfit or several "it" outfits because it puts you in such a peppy mood and you reflect that good energy while you're strutting your stuff everywhere you go. it affects people more than they realize. 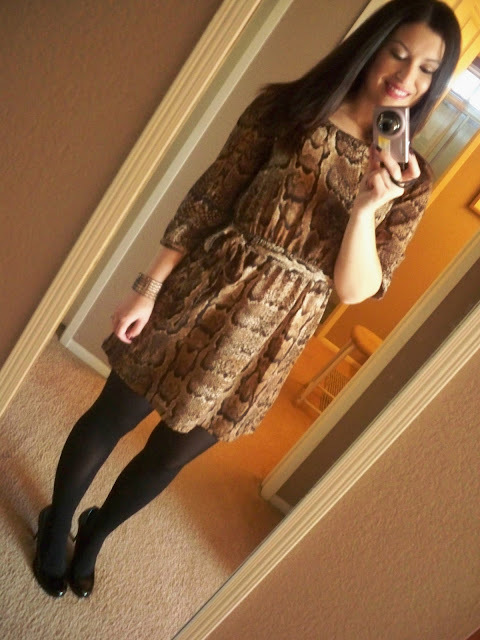 Love love love the H&M dress! Super cute! And I've got my eye on that clutch too! 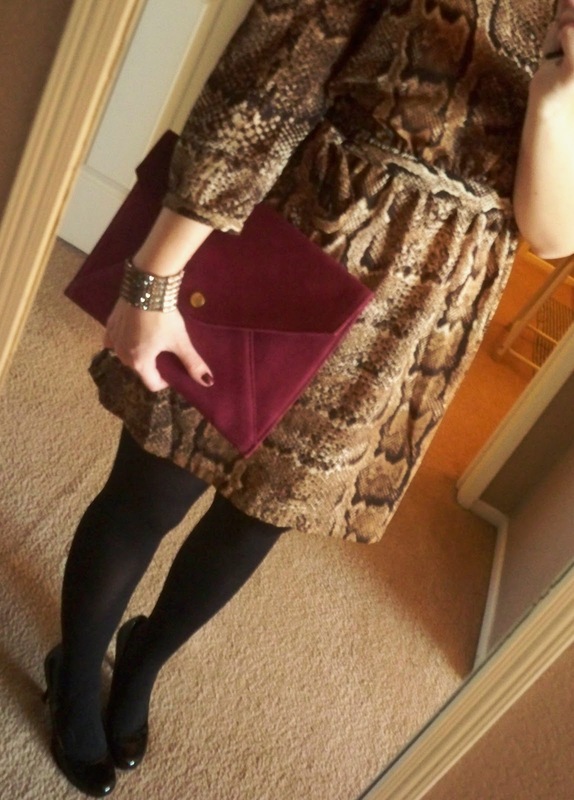 LOVE it...the snake print is awesome, and the clutch is perfect with it! noelle!! this outfit would make rachel zoe proud!! you are soooo glam chic with your snake print dress and i absolutely love the pop of color from your clutch! omg love that dress - so chic!!! & goodness shopping so close near the holidays, I hate it >_< I get so claustrophobic that I just can't deal with the hordes of people. Thank you, thank you everyone. Merry Christmas! Ok, this rocks girl!!! It's my favorite too! You look incredible.